Thank heavens, crisis averted! Gotta say that things have been pretty civil for a while now in the Forum and it's good to see. Not every difference in taste requires a flame-war, NIAD. Thank heavens! Things usually have a way of spiraling out of control rather quickly at times before cooller heads ultimately prevail . A period-piece Colecovision release would deserve a period-correct box. 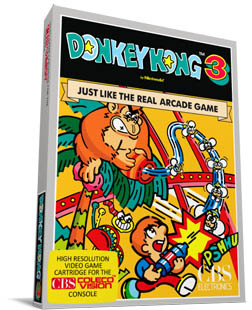 Recall that boxes like Congo Bongo, Bump N Jump, and Spy Hunter had full artwork on the front, and used the slogan "For Colecovision and ADAM Family Computer System". That looks great, Greg, but I dunno... Maybe it's the blue color along the edges, but when I look at that box mockup image, my mind says "Intellivision!". It looks like the one I made for CBS. Edited by Crapahute, Thu Oct 4, 2012 12:55 AM. Haha Luc! You've got a point there. That'd be enough to scare me off. Inty DK suuuuuucccckkkkkkssss!! Yah Vince, nice work too! I love the 3D images you've been generating. Actually I wouldn't mind to see this game appear on the CV if the controls are done smoothly. I used to be really good on the arcade game because of the joystick controls and when it was released on the NES with the D-Pad it was just awful. Playable but I wasn't nearly as good or as fun. This looks like a thread worth bumping. Are you still planning to release this? I'd think it'd be interesting. Here's a port to separate it from the NES: Radar Scope. If memory serves, that never got a single home port. My feelings on DK3 are very mixed. While I didn't hate the game, it most certainly was my least favorite of the 3 DK arcade games released and it rarely gets played in my DK arcade cabinet at home. (Which has all three games in it.) 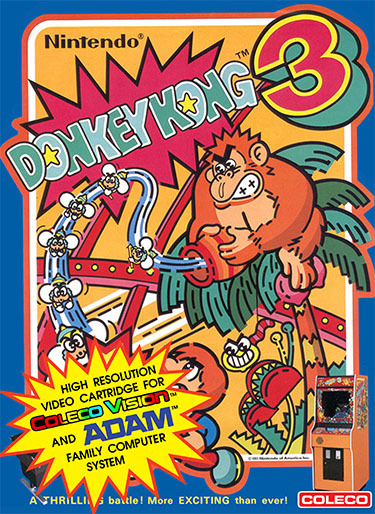 On the other hand, it would be nice to have the "complete collection" of DK games on the ColecoVision, but I can't help to think there are many other arcade games I'd rather see ported first. I love DK 3. totally different than the other but very fun. The only console home port i know is the NES version. It has been also ported on Japanese 8bit computer NEC and Sharp , i think. While it would be cool to see the third installment of the DK series made available for the CV, it's another one of those games that would have to be released on the Q.T. or run the risk of getting threatened legally by you know who. Finally, someone who agrees with me on that. As much as it was criticized when it came out, it seems that people today are always calling it their favorite. I don't think it deserves either. Most of the arcade games I like have been ported, the only ones left for me would be some more Pac-Mans (including Baby Pac-Man, using digital pinball) and, because it never got a single home port and deserves another chance, Radar Scope. And since I'm a Nintendo fan, I would like DK3 to be ported. I've only played the arcade version a few times, but from my little experience and from what I've heard, the NES version is quite lacking in comparison, so maybe the CV could do better there. However, something I would rather have done than DK3 would be better arcade ports of games. Since DK Arcade is already just a few months before release (and DK Jr. possibly coming next near as well), my top pick would be Mario Bros. It'd also be nice to have ones such as Moon Patrol, Time Pilot, and Rally-X. Either way, a website claims that Opcode is releasing DK3 next year. Yes, under the name "Donkey Kong 3: Dai Gyakushuu" (great counterstrike). This was sort of a semi-sequel as well, as it played much more like Galaga, such as having the platforming elements removed and adding bonus stages. Hopefully Collectorvision will produce more of their arcade controllers. Collectorvision released a great real arcade feel controller a couple years back, but they stopped producing it. Maybe they'll start again, though. They also planned to release arcade controllers for specific games, but I believe that either this never came to be, or only a limited number were released. Yes I had that in mind. I have you on my ignore list but now that you're a global moderator I'm now forced to read your posts unfortunately for me.